Turn almost any veg into a tasty and healthy meal by using up different vegetables lurking in the fridge. The ingredients given are more of a guide than a prescriptive list. The dish works equally well with mangetout, cabbage and pak choi. Just remember to start with the vegetables that take longest to cook. Wash the peppers, halve them, deseed and cut into thin strips. Wash and finely slice the white part of the spring onions. Peel and crush the garlic. Peel and grate the ginger. Wash the chilli, deseed and finely slice it. WIpe the mushrooms and cut into quarters. Heat the oil in a wok or large frying pan. Add the onion, garlic, ginger and chilli and stir-fry for 2 minutes. Add the peppers and mushrooms and stir-fry for about 6-7 minutes, until soft. Add the spinach and bean sprouts to the stir-fry in a couple of batches and continue stirring. When the leaves have wilted, add the soy sauce and cook for 1 minute. Pour in the coconut cream and warm through. This will take a couple of minutes. 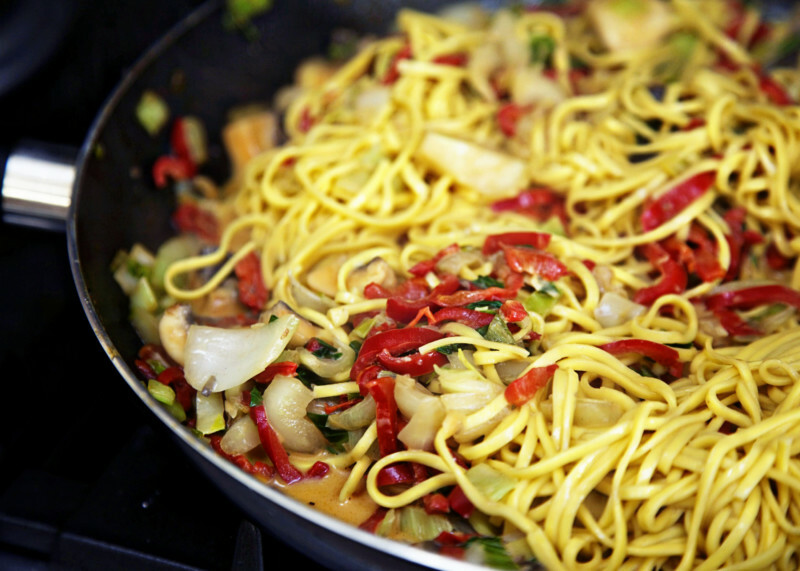 Drain the noodles and add to the vegetable mix.